What do goths wear aside from all black? There are quite a few gothy embellishments available for the gothic wardrobe to be complete. First and foremost, there are the black rubber bracelets. You will receive 100 bracelets, in which case you are to put 50 on both arms. How are these goth, you ask? Well, Madonna, a popular singer from the 80’s and 90’s of the 20th century, had made them very desirable during the 80’s. How is Madonna goth? Two words: “Frozen” video. What? The “Frozen” video was made in the late 90’s? How dare you question me! Reflective sunglasses, to be worn day and night, outdoors and indoors. You must protect your eyes from the viscous sunlight who is now your mortal enemy! A plastic, black spider ring like the type worn at Halloween shall be supplied. Any reference to Halloween is about as goth as you can get. Spiders and bats are now your two favorite animals. Remember this when you go to expand your wardrobe. Spider net stockings, bat patterned t-shirts, all are goth. 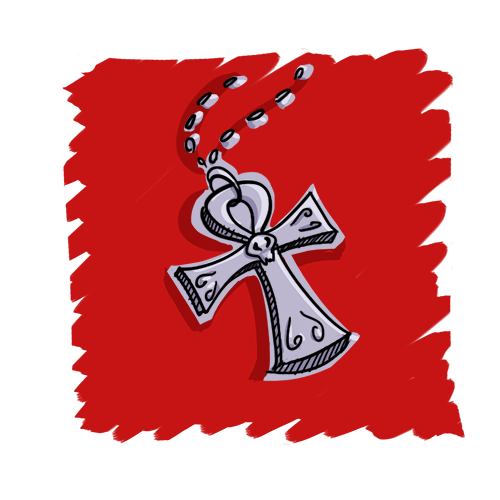 and finally, a cross or BIG ankh (like “Death“, from “Sandman“!) to wear around your neck. Religion is now to be despised, and mocked by you. 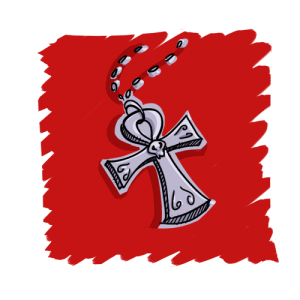 But there is a certain appeal of religious iconography that draw you closer…Perhaps that naked Jesus on the cross, with Nails pounded through his flesh…Tres Goth, trust me.